Since the beginning of this year, we have been sending our investors a new-look daily summary email with concise overview of all the important account related information, performance data and news. The revamped email structure aims to make the account related information more accessible and visible to the investor by bringing it all into one place. This also mimics the same principle used in investor Dashboard. The primary goal for changing our email and notification logic was simplification and reducing duplication. In order to advance this goal, we will also be removing the Private Inbox feature from the investor user interface. Our statistics has shown that the Private Inbox feature usage among investors has been very low for a while now and with the recent changes it has become redundant in the current form. Private Inbox will be removed from the user interface on February 6, 2017. To give a better understanding of what the new Daily Summary email entails, let’s take a look at the information covered in the email sections below. The topmost section of the email is reserved for status notifications. These status messages are triggered by events or actions related to your account. For investors, these messages are meant as guidelines about what actions are expected from them. Here you will see messages about incomplete ID forms, or an alert that there are no funds to invest etc. This is a quick outline of all transactions occurring in your account on the previous day. This is the best place to look for recent information. What is the total value of my portfolio? How much have you earned to date? Keep up to date on our latest posts. This section includes links to the five latest posts on Bondora blog. We provide the complete content from the latest blog post so you can stay informed without having to leave the Daily Summary. We offer payment details in the email so it would be easier for you to make deposits to your Bondora account from your bank. We include your automatically generated referral link for easier sharing. 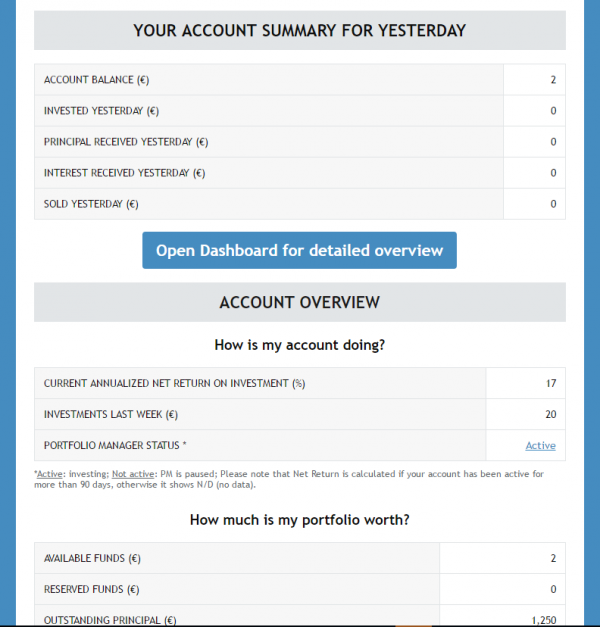 The same link is also available on you investor Dashboard under the Refer-A-Friend tab. Remember, the average earned bonus per investor has been €168. Here we provide an overview of what is happening in the Primary Market. This section summarizes the loan funding activity.